PhotoSync is one of the most used apps on my iDevices. It lets you share photos between iOS devices, as well as from iOS-to-Mac (and PC), and it’ll do so over your Wi-Fi network, or automatically over Bluetooth (with no configuration). v2 has jsut been released as a free update to existing users. I’ve been using the beta for a month or so, and it is awesome. Previously, sending edited photos from iOS would send the original file. Now any crops and filters are applied before transfer. This is super-useful now that iOS 7 has some really great photo filters. This feature is off by default as it can slow down old machines with just 256MB RAM. You can now choose which album photos are sent to on the receiving device, by choosing them on the sending device. This is neater than it first sounds. For instance, if you send a lot of screenshots from your iPhone to your iPad, you can now do it without cluttering up the Camera Roll. And you can even create a new album. This is also great for keeping pictures together. Imagine you are on vacation, taking pictures with an iPhone and a regular camera, and corralling all the images on your iPad. 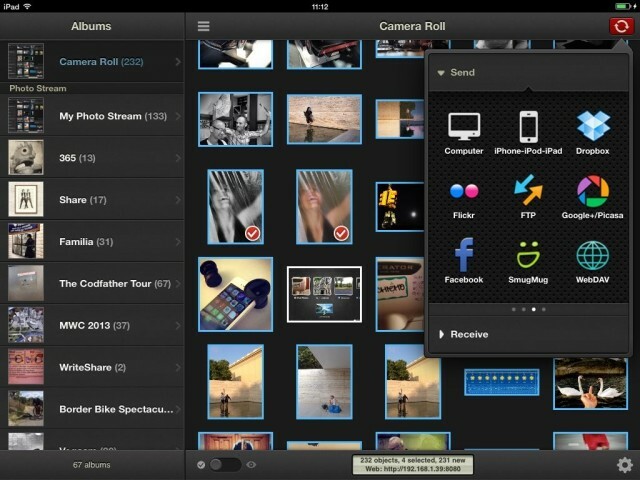 Now you can create a vacation-specific folder on the iPad and save everything to that, bypassing the camera roll. I actually ordered a Toshiba FlashAir just to try this out (the Amazon courier should arrive any second now). Photosync will let you transfer your pictures straight from a camera equipped with a wireless SD card. If you’re using a Toshiba FlashAir or a Transcend Wi-Fi SD, you can grab pictures straight from the card and save them into a custom album (avoiding iOS’ annoying Events creation). Better still, if you have the right setup you can actually see a grid of thumbnails on the card, and pick which ones to transfer. PhotoSync can now automatically fire up and transfer images when you enter a certain location. Thus you could have your iPhone upload its photos to Dropbox when you arrive home (yes, it uploads to pretty much any service you can think of), and you can tell it to do so only when it’s on your fast Wi-Fi network. This actually solves a problem Leander has been having with his family. He’s got like 20 kids, and wanted their photos to all get slurped into the same Photo Stream. In the CoM chatroom, Rob suggested Dropbox, but that needs the kids to actually open the app from time to time. This method is automatic. You can receive images from any of your configured online source. This means that – for instance – I can browse my Dropbox Camera Uploads folder by thumbnail or full-screen preview, flag photos as I go and then download them all. You can even share photos using the standard iOS sharing dialog, right from the Dropbox/Flickr/[insert service here] view. I use iPhoto or the Flickr app to upload pictures to Flickr, but I like this feature because it means that you only need one app to do pretty much anything with your photos on iOS (bar the editing, of course, for which you only need SnapSeed). You can add captions and titles for all photos and videos before sending them off to Flickr, SmugMug, Picasa, Facebook or Zenfolio. There’s a ton more in here. If you’ve been counting, then you’ll know that I didn’t get close to the 50 new features. Just know that Photosync 2.0 is improved in every way, from the easier-to-use interface, to the list view, to the seemingly-way-faster transfer, to the fact that you can use the app as a fantastic image browser in its own right. I have it as the first icon on the second home screen of every iDevice I use regularly (even The Lady’s) so I can find it fast when I need it. Which is often. Oh, and it’s $2. I can’t think of any good reason why you shouldn’t be buying this app right now.